The topic of photosynthesis is a fundamental concept in biology, chemistry, and earth science. 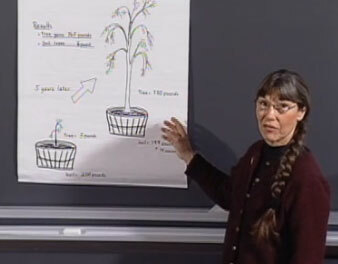 Educational studies have found that despite classroom presentations, most students retain their naïve idea that a plant’s mass is mostly derived from the soil, and not from the air. To call students’ attention to this misconception, at the beginning of this lesson we will provide a surprising experimental result so that students will confront their mental mistake. Next, we will help students better envision photosynthesis by modeling where the atoms come from in this important process that produces food for the planet. This lesson can be completed in 50-60 minutes, with the students working on in-class activities during 20-25 minutes of the lesson. As a prerequisite, students need an introductory lesson on photosynthesis, something that includes the overall chemical equation. If students have already studied the intracellular photosynthetic process in detail, this video can still be very helpful because students often miss the big picture about photosynthesis. Materials needed include red, white and black LEGO bricks (described in downloadable hand-out) or strips of red, white and black paper plus paper clips (directions provided in downloadable hand-out). In addition to class discussions, the major in-class activity of this video involves the students’ modeling with LEGO® bricks or colored paper where the atoms come from in photosynthesis. Read “Materials…” to decide which activity to select. Choose Bricks or Paper. Download the appropriate set of guides. Kathleen Vandiver received her Masters degree in education from the Harvard Graduate School of Education and a Ph.D. in cell biology from Tufts Medical School. She worked as a research biologist and as a secondary school science teacher before coming to MIT as an Outreach Director. A good online reference for explaining glucose, starch and cellulose structures that will connect very well with Dr. Vandiver's video contents and class activities. Minds of Our Own: A video documentary on education and learning for K-12 educators and parents; 3 one-hour video programs and guide. This documentary uncovered many student misconceptions. The misconceptions in the video “2. Lessons From Thin Air” form the basis for the Blossoms lesson on photosynthesis.